I normally don't eat an afternoon snack this large but it is Sunday and my eating schedule is a little messed up so I needed a bigger snack. This covers all the food groups: veggies, fruits, protein, dairy, and chocolate of course!!! 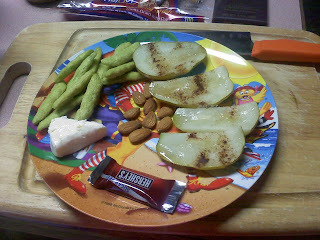 It's snap pea crisps, laughing cow light cheese, 10 almonds, a pear cooked in cinnamon, and Hersheys sugar free dark chocolate.